Countertops and Vanity tops are meant to be decorative, but they also need to stand up to the kind of stresses found where they are typically installed in kitchens and bathrooms. These locations expose countertops to heat, moisture, and even metal abrasion. In the kitchen, where you are likely to have hot pots and dishes, or where you'll be using metal utensils, a granite countertop is highly recommended. In the bathroom, an area that will be saturated with moisture, a dense material like granite will serve you well as a vanity top. You will enjoy our granite countertops for their undeniable beauty as well as their strength, durability, and low maintenance care. Granite has a toughness that surpasses any synthetic countertop material when sealed and properly maintained granite may outlast the rest of your home. Granite is a naturally beautiful material. 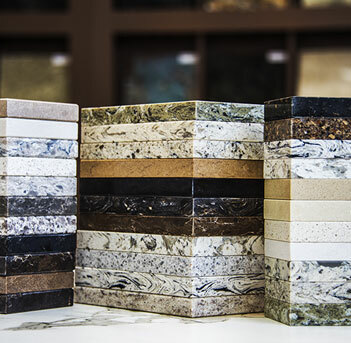 Its unique patterns vary from slab to slab, and granite's natural colors can complement any decor. Granite countertops and vanity tops are true statements of refinement in your living or working space.